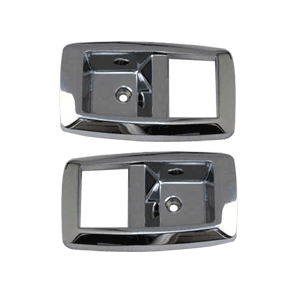 * Chrome Plated Finish Innovative Bold Styling: Replace your cracked, faded or broken plastic door handle bezels with UPR's Billet Aluminum CNC Machined Chrome Door Handle Bezel Kit. Kit includes both bezels and stainless steel hardware. Quality Construction: Designed to replace the weak stock door handle bezel and CNC Machined for a precise fit, while giving you the bold clean styling of our Aftermarket Dress Ups, Suspension and Performance Parts for your American Muscle Car! Installs in 5 minutes or less. Includes all hardware needed for an easy install. Fits these Vehicles: 1979 1980 1981 1982 1983 1984 1985 1986 1987 1988 1989 1990 1991 1992 1993 GT LX Mustang Roush Saleen Vehicles. Made in the USA!